(NASHVILLE, Tenn. – May 19, 2016) Parking technology innovators will compete for a shot at fame and fortune during the 2016 IPI Park Tank™ competition, Thursday, May 19, 11:00 a.m. – 12:30 p.m., at the International Parking Institute’s (IPI) 2016 Conference & Expo in Nashville, Tenn. Sponsored by IPI’s Smart Parking Alliance and fashioned after the popular ABC-TV reality show, “Shark Tank,” IPI Park Tank™ will give five entrepreneurs a platform to present their creative solutions to tough parking challenges before a panel of “sharks,” who will provide expert feedback on the finalists’ concepts before seeking input from members of the audience. The People’s Choice Award will go to the idea that garners the best reaction from the crowd through app-polling onsite during the event. The judging “sharks” include Maria Irshad, CAPP, MPA, assistant director, Parking Management Division of the City of Houston; David G. Onorato, CAPP, executive director, Public Parking Authority of Pittsburgh; Christian Noske, Investment Principal, BMW Ventures; and R. Graham White III, partner, Atwater Infrastructure. Winners of last year’s Park Tank™ competition, Smarking CEO Wen Sang and Director of Growth Diego Torres-Palma, will showcase their innovation at the Expo in exhibition space that was part of their winnings last year. Aided by the competition’s visibility to an international audience, the MIT spin-out company now works with municipalities, airports, and other parking operators, using existing data and predictive analytics to maximize availability and pricing of parking. As with Smarking, this year’s top-scoring concept will be recognized at the IPI Conference & Expo, profiled in the IPI membership newsletter IPInsider and The Parking Professional magazine, and awarded exhibit space at the 2017 IPI Conference & Expo in New Orleans, La. Eunice Choe of ParkAlong, an online parking marketplace connecting homes and businesses with extra unused parking capacity for drivers by enabling them to reserve convenient and cost-effective parking places. Jennifer Ding of ParkIT, a computer vision software that uses existing camera infrastructure to provide accurate parking data in outdoor environments. Kevin Dougherty of the Barnacle Parking Enforcement System, an enforcement device that attaches to windshields using commercial-grade suction cups, blocking the driver’s field of view and immobilizing the vehicle. Travis Knepper of RideHop, an on-demand service during off-peak times for fixed route parking shuttle systems that allows fleet operators to reduce fleet use when shuttle demand is reduced, while providing a reliable service for off-peak riders. Ofer Tziperman of Anagog Ltd., a crowdsourced, global, on-street parking network that predicts where parking spaces will be vacated across the globe. The IPI Smart Parking Alliance (SPA) provides a forum for IPI supplier members to share thoughts, ideas, and expertise, with the overall goal of providing support for the IPI’s mission to advance the parking profession. Park Tank™ is designed to become an incubator for the next great industry advancement. 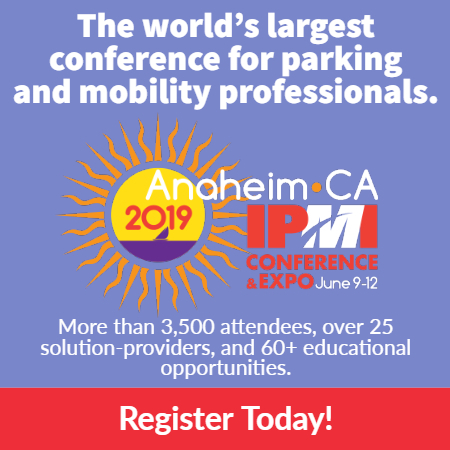 The International Parking Institute is the world’s largest parking association of parking professionals and the parking industry. www.parking.org.